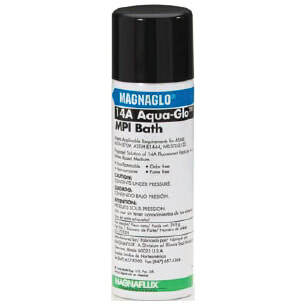 This water-based, non-flammable aerosol contains high-sensitivity 14A fluorescent magnetic particles and is primarily used for field testing with a portable magnetic field generator. 14A Aqua-Glo is ready-to-use, and creates a bright yellow-green fluorescent indication when viewed with ultraviolet light. The ultra-sensitive particles provide clear, bright, fluorescent green indications under ultra-violet light for unbeatable inspection quality and accuracy.